The funding was announced by Federal Member for Corangamite Sarah Henderson MP at the football match between the Inverleigh Hawks and Geelong West Giants at the Inverleigh Sporting Complex on Saturday 6 April, 2019. The project will be fully funded in the 2019/20 Federal Budget. 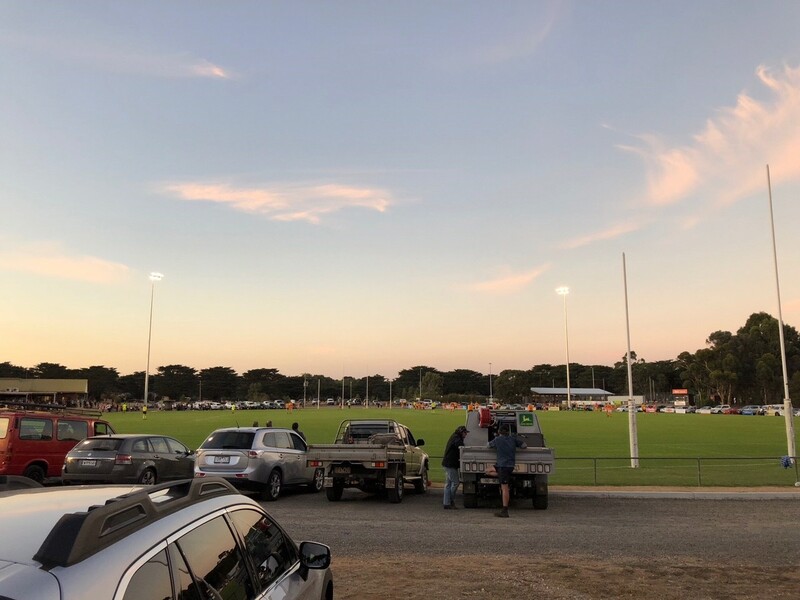 The Inverleigh Football & Netball Club advocated to the Federal Government for the upgrade of the social rooms which will cater for increased activity at the Inverleigh Sporting Complex, fuelled by the lighting upgrade delivered at the site early last year. Council will continue to lobby State and Federal Government for the refurbishment of existing dated change rooms and the construction of additional new unisex change rooms at the Inverleigh Sporting Complex. This $940,000 project would deliver female friendly facilities that are compliant with AFL Victoria ‘local level’ guidelines to service both ovals. This latest announcement adds to an impressive list of sporting and recreation projects in the works in Golden Plains Shire. Last week, the State Government and Council announced its partnership to deliver a lighting upgrade at Rokewood Recreation Reserve. Construction of new lights at Linton Recreation Reserve, also funded at the State Government and Council, is almost complete; and in February, Council secured a Federal Government grant of $500,000 for new lights at both ovals at the Victoria Park Recreation Reserve in Bannockburn. Also funded by the State Government and Council, the following projects will soon be completed and delivered to the community: a new netball court, multi-purpose court and shelters at Victoria Park in Bannockburn; and a significant upgrade of the Smythesdale Skate Park to create a premier regional skate facility. Mayor Cr Owen Sharkey says Council is delivering an unprecedented program of new and improved sporting facilities, and welcomes the latest announcement by the Federal Government. “Improved social rooms at the Inverleigh Sporting Complex will support the local clubs to attract more players, increase club membership and build their supporter base. It’s a valuable project not just for the sporting clubs but for the whole Inverleigh community who attend matches and events at this great community facility. “Council will also continue to seek further support from the State and Federal Government to fund the construction of new change rooms at the Inverleigh Sporting Complex that will deliver unisex, compliant facilities that encourage more female participation in local sports as the population of Inverleigh and Golden Plains Shire continues to grow. “Council has lobbied hard for government investment in community facilities in Golden Plains Shire and we thank the Federal Government for supporting the future of our local sporting clubs with this new upgrade project. We are pleased to welcome this allocation from the Federal Budget and with the federal election on the horizon, Council will continue to seek strong bi-partisan commitments for the people of Golden Plains Shire."